The Tasha Be movement practise is my primary tool for helping myself and my clients better organise our physical bodies in order to find balance and clarity within every aspect of our lives. When you’re working physically on your body there is no way you are not also affecting other aspects of your life. For example gaining strength through your pelvis and legs will invariably have you feeling more grounded and self assured, which may then gift you the courage to make big decisions such as changing jobs, leaving a relationship, or signing up to study something you’re passionate about but have never given attention to. ‘NLP’ explores how we know what we know, and how we do what we do. Neuro refers to the brain and nervous system. Linguistics to language, so, Neuro Linguistics is the study of the language of the nervous system or how the nervous system codes and organises information. Metaphorically NLP is like brain software. There are many people, myself included, who work out what direction they want to take in a certain aspect of their life but put no tools in place to actually make it happen….instead we sit there wondering why it isn’t coming to us. To help you learn the really easy steps that can bring momentum and fruition to your plans I’ve pasted an article below by Lynn. I have been working with Lynn for over 15 years now and I cannot possibly thank her enough for the profound effect she has had on my life and those who I work with. 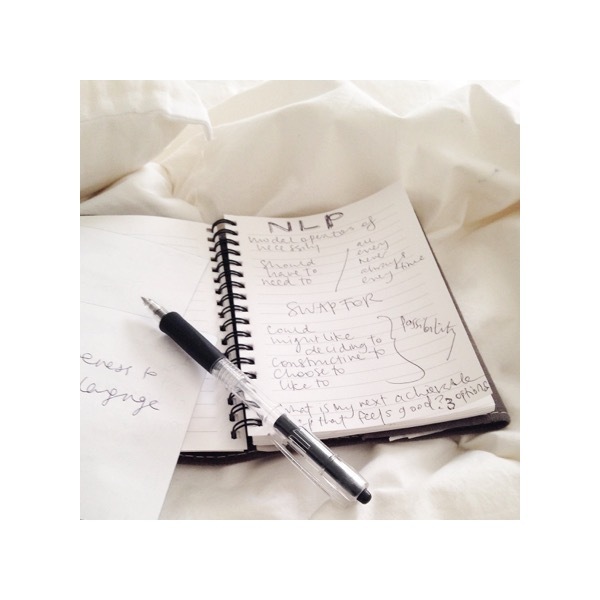 Some of the issues I have turned to NLP for help with are: fear of failure, how to study efficiently, relationship guidance, anxiety around illness and death, fear of not being ‘x’ enough, what direction to take my business. Thankfully she is now available over Skype so I don’t have to wait until I go back to New Zealand to see her! Have a read below and take a gander through her website where she has many other incredibly helpful articles. By Lynn Timpany NLP Trainer. Once upon a time… there was a miner stuck down a mine shaft in a large and dark cavern. With absolutely no sense of which direction to go, to get out of the hole he was in, the miner could only see as far as the small circle of light projected by the lantern on his helmet. This particular miner was totally clear about his outcome, he wanted to out of there alive, preferably home in time for tea! It’s easy to understand that if that miner stands there and waits till he’s clear and sure about the direction of the exit before moving then he may stand there in the same place for an awfully long time! Outcome setting is one of the fundamental first step processes in NLP. We understand that in setting a clear and sensory specific outcome we give direction to the automatic functioning of the filters of the unconscious mind, which is in itself a change process. Yet to me there seems to be some real limitations in the traditional goal setting models. Perhaps the setting of a fixed goal in the future may be one of the biggest nominalizations of them all! This person is just as disempowered as the miner who stands in the cavern waiting to know the way out before moving. before the outcome exists fully in ones reality. Basic Steps to a Building Outcome Bridges Discussion. Denominalise the outcome. i.e. ask a lot of questions that have a lot of “ings” in them, and combine the denominalised sense information with “being doing having” words. What will you be doing that you don’t do now when you are having that outcome? What will you be saying to yourself differently when you are having that outcome? How will you be feeling when you are doing that outcome? etc. You can also ask similar questions from different perceptual positions. What will others be seeing you differently when you are being that outcome? How will you be being different to others when you are doing that outcome? Devolve toward the short term by asking similar type of questions about the near future. As you are totally aligned toward that outcome what will you be doing differently next week? How will you be thinking next week as you are aligned toward that goal? What will you be thinking that’s supporting your achieving your goal? What will you be seeing that lets you know you’re aligning with your goals next week? How do you need to be responding, right now, in any moment, to be aligning with the outcome, before the outcome exists in reality fully? When you are aligning toward (outcome) how will you be thinking about, and dealing with (non-outcome) differently? Elicit a full version sensory specific representation of this and future pace it. Followed by future pacing the successful completion of the intermediate steps and the final goal. As the miner walks to the edge of the available light, from there he sees further.